Looking for a new way to dress up chicken breasts? 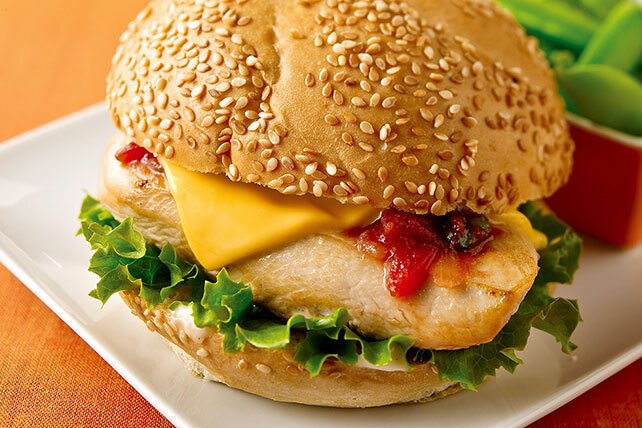 Top them with salsa, cheese and creamy ranch dressing, then sandwich 'em in soft hamburger buns. Heat skillet sprayed with cooking spray on medium heat. Add chicken; cook 5 to 7 min. on each side or until done (165ºF). Remove from heat. Top with salsa and Singles; cover. Let stand 2 min. Meanwhile, spread bottom halves of buns with dressing. Fill buns with lettuce and chicken.